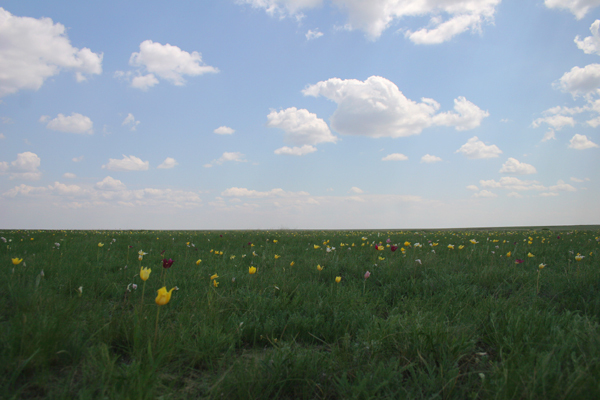 During the two days spent out in the steppe in Kazakhstan I couldn’t help but notice the sheer number of flowers that dotted the grassy steppe. It seemed that anywhere one looked some kind of flower, whether it was an iris, a tulip, or something else, was blooming. So when we were on our way out of the Korgalzhyn State Nature Reserve and it was announced that we were making a stop to see tulips I was kind of surprised because we had been seeing tulips rather regularly. 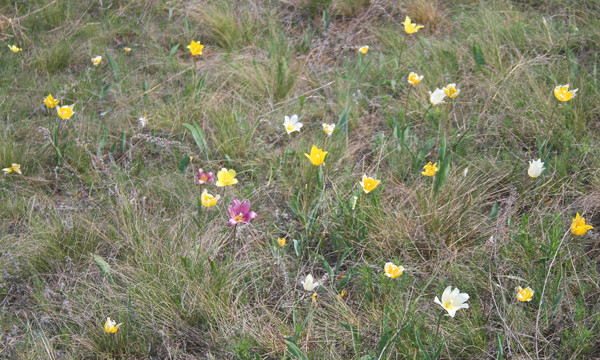 It turns out that what we had been seeing had been the pathetic remnants of the main blooming of the steppe’s tulips and we were making a special stop at a location where, for whatever reason, the tulips had bloomed late this year. Now I don’t know about you but I am used to tulips planted in orderly rows of matched colors in gardens. It was so much nicer to see tulips blooming wherever they happened to pop up, with the green grasses and endless steppe sky as a backdrop. 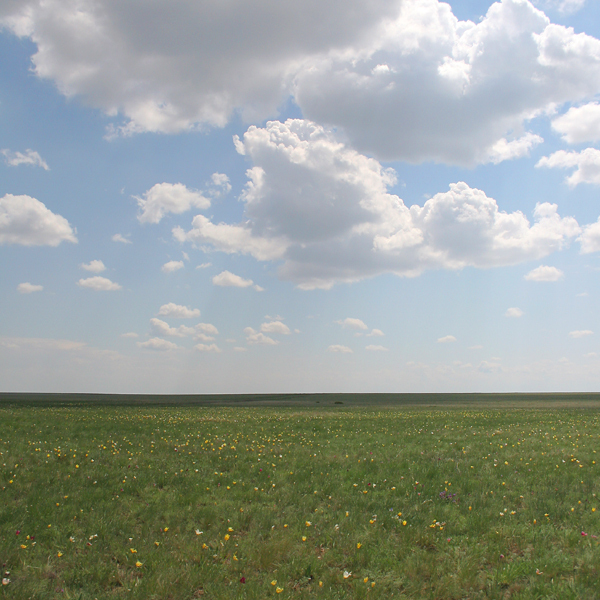 I could have sat for days and watched the interplay of cloud and sky and sun and grass and flower but we had birds to see and a plane to catch so our time on the steppe in the tulip patch was rather short. Despite our short stay I was intrigued by the tulips and wondered how they had all ended up on the steppe. Was it part of some gigantic-scale gardening project planned by the Soviets when Kazakhstan was a part of the USSR? Did some kind of animal eat the tulips and spread them in its droppings? Had a horde of Dutchman went on some kind of rampage hundreds of years ago and spread their tulips over the steppe in some kind of diabolical plot to make everywhere like Holland? No, no, and no! It is unclear who first brought the Tulip to northwest Europe. The most widely accepted story is that of Oghier Ghislain de Busbecq, Ambassador from Ferdinand I to Suleyman the Magnificent of the Ottoman Empire in 1554. He remarked in a letter that he saw “an abundance of flowers everywhere; Narcissus, hyacinths, and those which in Turkish [are called] Lale, much to our astonishment, because it was almost midwinter, a season unfriendly to flowers” (see Busbecq, qtd. in Blunt, 7). In Persian literature (classic and modern) special attention has been given to these beautiful flowers and in recent times tulips have featured in the poems of Simin Behbahani. However, the tulip was being written about by Persian poets as far back as the thirteenth century. Musharrifu’d-din Saadi (poet) in Gulistan described a visionary garden where ‘The murmur of a cool stream / bird song, ripe fruit in plenty / bright multicoloured tulips and fragrant roses…’ resulted in a paradise on earth. By 1559, an account by Conrad Gessner described tulips flowering in Augsburg, Bavaria in the garden of Councillor Herwart. Due to the nature of the tulip’s growing cycle, the bulbs are generally removed from the ground in June, and they must be replanted by September to endure the winter. Busbecq’s account of the supposed first sighting of tulips by a European is likely spurious. While possible, it is doubtful that Busbecq could successfully have had the tulip bulbs removed, shipped, and replanted between his first sighting of them in March 1558 and Gessner’s description in 1559. After introduction of the Tulip to Europe, it gained much popularity and was seen as a sign of abundance and indulgence in the Ottoman Empire. The era during which the Ottoman Empire was wealthiest is called the Tulip era, or Lale Devri in Turkish. Another oft-quoted account is that of Lopo Vaz de Sampayo, governor of the Portuguese possessions in India. When he returned to Portugal in disgrace after usurping his position from the rightful governor, Sampayo supposedly took tulip bulbs with him from Sri Lanka. This tale too, however, does not hold up to scrutiny because tulips do not occur in Sri Lanka and the island itself is far from the route Sampayo’s ships should have taken. Even the term “tulip” comes from an Ottoman Turkish word. The word “tülbend” means “muslin gauze” and made its way to English through Latin (turban derives from the same root). This post was originally published on 7 June 2009 but it is too good to leave languishing in the archives! My trip to Kazakhstan was made possible by the wonderful folks at Swarovski Optik who sponsored the trip not only to draw attention to their marvelous optics but to the fact that Swarovski Optik is, with the RSPB, the Species Champion for the Sociable Lapwing, a critically endangered species that breeds almost entirely in Kazakhstan. We here at 10,000 Birds salute Swarovski Optik‘s commitment to conservation. We have a Tulip festival every May in Albany to celebrate our Dutch (And apparently Kazak) heritage. Those grasslands look incredible. The fact that tulips did not evolve in the Netherlands should rank as the most interesting fact of the week if not the month and I can’t wait to enlighten my Dutch friends (assuming they don’t know). And so did the Americans developed the native Australian Macademia nut for commercial use in Hawaii. Now us in Aussie reaping the benefits too. It was discovered that the Tulips thrive well on particular soil behind the dunes in Holland, they call there the “geest gronden” a particular type of soil, a mixture of sand and clay..